Author and miner and photographer Pat McMahan, at left, speaking with a customer during the Quartzsite Pow Wow. Editor's Note: This blog features insights about the rockhounding travels of Thomas Farley, as he gathers materials for a book about rockhounding in the southwestern United States. 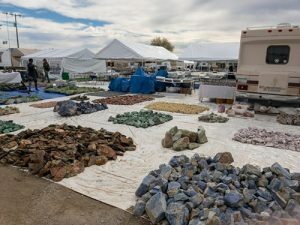 In this installment, Thomas provides a field report from time spent at the recent annual QIA Pow Wow Gem & Mineral Show in Quartzsite, Arizona. Nearly 70 degrees today at the Pow Wow. Brilliant sun with no wind. Forgot the sunscreen. You may also want to bring your rockhounding tools. Each day during the Pow Wow, the Quartzsite Road Runner Gem and Mineral Club arranges two field trips each morning to collecting areas near and far. Only two dollars for non-members each trip. 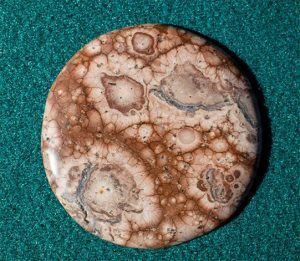 The picture at left is of a not-for-sale cabochon of birdseye rhyolite. It was shown to me by a field trip leader. It represents material that his group is going to try to collect Thursday morning. Trips to to other locations will find rockhounds searching for things like agates, marble, porcelain jasper, and sagenite. was kicking up. Got there a little too early. Most vendors don’t get going until 10:00 a.m. but some are open before then. Giant show place, many acres. Features the smallest mineral specimens to big rough, I mean forklift size pieces in some cases. Desert Gardens carries far more rough than the Pow Wow. And it’s less crowded when the Pow Wow is going on. Lots of time to talk to the dealers. I think Desert Garden goes to the end of February. By that time, many of the sellers are making plans for Tucson but for many dealers and miners, Quartzsite is it. Back in Las Vegas, Nevada today, but at top is a parting shot from the Pow Wow, still going on over the weekend. 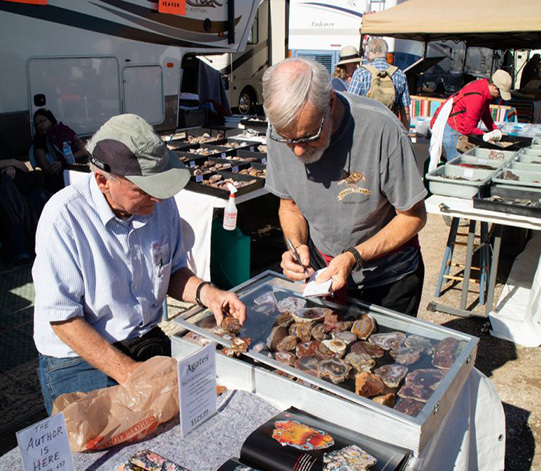 The very first photo in this blog features author and miner and photographer Pat McMahan (left) patiently and with fondness for his slabs, identifies the agates a customer just bought. Pat is the author of the monumental "Agates: The Pat McMahan Collection," endorsed by Bob Jones, which was the product of a year and a half of full time work, the result of over 26 years of collecting. You can’t have a shopping experience like this on eBay! Chelsea and John Keady, owners of Rock Chuck. The future of our hobby and our profession is with the young. 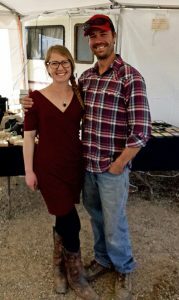 Pictured above are Chelsea and John Keady, owners of Rock Chuck in Schurz, Nevada. They are miners and jewelry makers, often creating pieces from the stones they have dug. Say hello to the future. 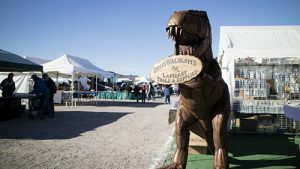 A giant welcome to this area of the Quartzsite Pow Wow, courtesy of David Walblom's Lapidary Tools & Supplies. We will be sharing posts and portions of posts penned by Thomas during his journeys, as a means of sharing in the spirit of adventure. For more information about Thomas, visit his site https://southwestrockhounding.com/blog.